Fg09 Lawnmower - Szevafém Kft. The FG09 lawn-mower made by Szevafem is available to working in household plot, in weekend cottages, grass fields, parks, residencial areas. 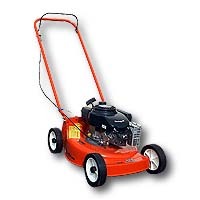 The lawn mower can gather the grass into a grass-sack or dump it out on the ground. The FG09 can be ordered with engine. The parts of the lawn mower are the followes: frame, motor, adjustable driven wheels, gatherer sack, rotary blade, grass ejector.